May I have an extra slice, please?... | Crumbs of cake wisdom with no sense of purpose. The type of cake I never thought I’d make… But then I volunteered for the smash cake for a friend’s son’s birthday before knowing the theme, so here comes a sports cake! Wasn’t sure how ‘smashable’ fondant would be, so I made an extra cupcake in buttercream only, but smashed by the little guy that big ball was! 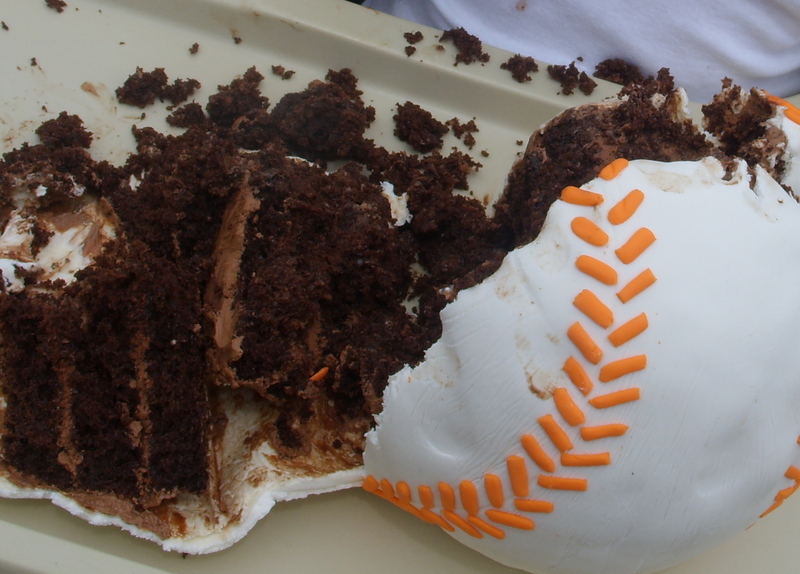 The baseball had some unintended but very realistic texture… I wasn’t sure how easy it would be to smooth fondant over a sphere, so to prevent overstretching, cracking and tearing, I rolled the fondant (Choco-pan) on a thin piece of plastic (in retrospect, I don’t think I would have been able to do it otherwise, the shape is very tricky…). Then, I flopped the fondant, with the plastic, over the sphere and proceeded to smooth it on, still without removing the plastic. It resulted in tiny, little, uniformly shaped, very shallow indents/folds, all around the ball – just like leather! 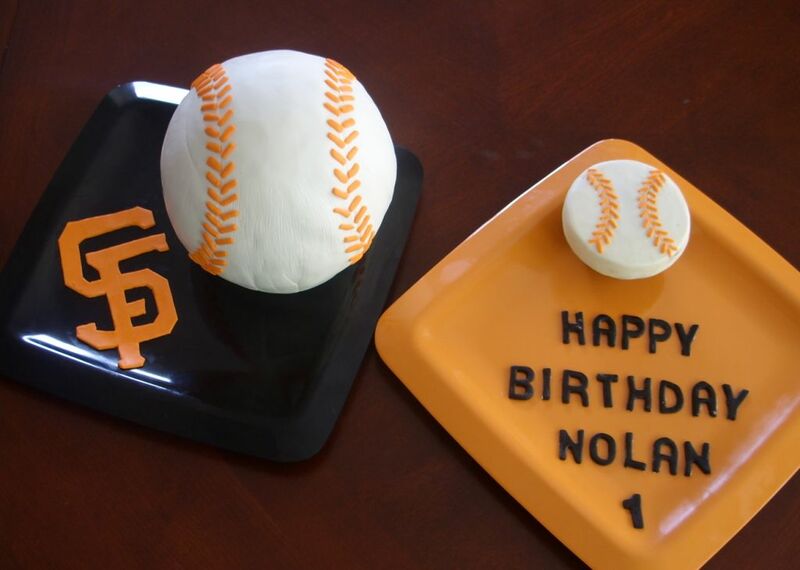 “Stitching” those baseballs was very time consuming as I rolled fondant very thin and cut it in tiny little pieces for each stitch… I’m pretty exited about how the cake ended up, considering I’ve never seen a baseball up-close and personal… Giants logo was free-handed on fondant. My Halloween serving plates ended up the perfect match! Yup! Made for my very close friend (who’s obviously very passionate about penguins) and her twin brother (unfortunately several thousand miles away). 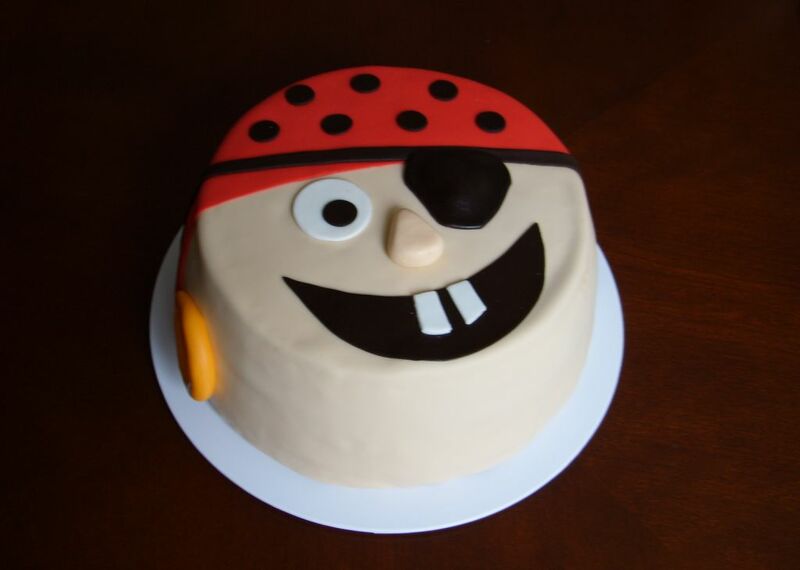 I’ve only known them since… hm… all my life – I was almost two years old when our parents first became friends and the then-crawling duo invaded the house, only to spend our entire childhood adventuring together… I *think* she liked her cake very much! 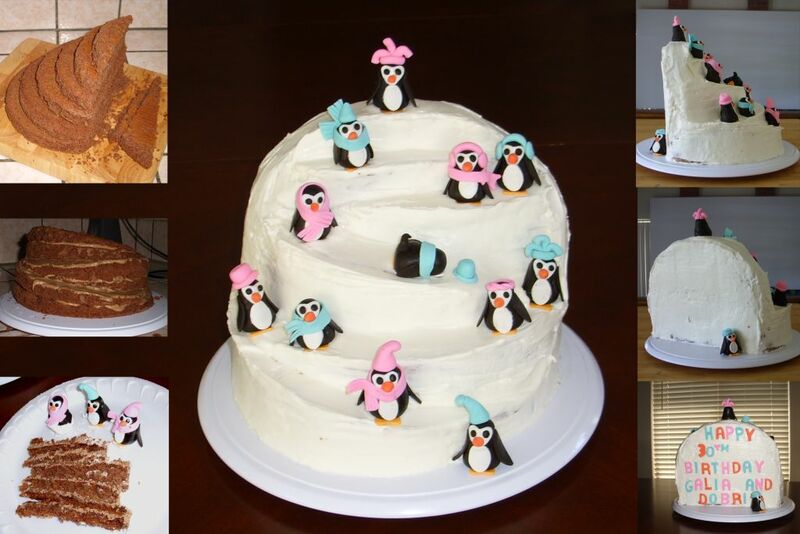 I intended to make 30 penguins, but realized cake was too small to support so many – plus at 2am, that sounds like an impossibly numerous waddle… I made two batches of my flourless walnut cake recipe (by my friend’s request) in 10-9-8” layers, about 1.5” thick. First, about 1/3 of each layer was cut to make another layer, then each layer was torted under an angle similar to the topsy-turvy cakes, for the slope effect of a total of 6 layers in 12 tortes (whew, did I get all those numbers right?). There was a small setback mid-way though the assembly, with the top 6 tortes sliding off as a whole from the bottom group, but such sliding disasters usually prove quite agreeable after sticking butter-based filling in the fridge for a few minutes! Swiss meringue butter crème snow – can you tell I was out of white fondant?! I had a blast making those little penguins. They’re not hard at all, but they are time-consuming. I’ve seen several penguin cakes and fondant/gum paste penguin figures on my favorite cake website, so I took ideas from there… Each penguin starts as a black ball, gently rolled to shape. Eyes are a heart-shaped white cutout, with black straw-cut tiny pupils. Noses are little tiny dark orange cones. Belly is a white ellipse. Wings/flippers are two leaf-shaped side cutouts from a circle. Feet are also a heart-shaped cutout, in pale orange. 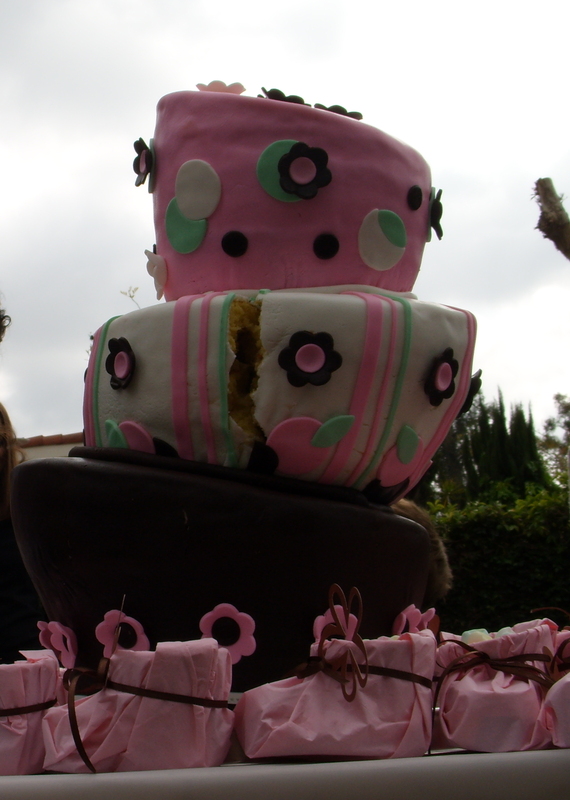 Then hats, scarves and earmuffs are just pure fondant fun! I prepped everything first, then just used egg whites to glue the pieces together – line production rules! When deconstructed like this, anyone can make a little cute penguin! 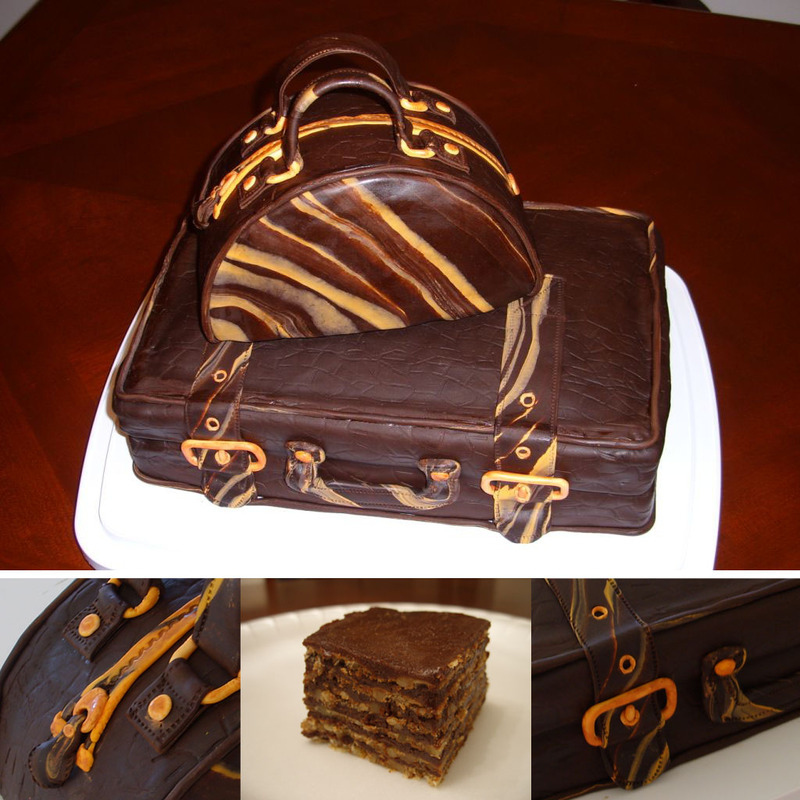 Purse is 8” chocolate cake, cut in half, then each torted in 3, with dark chocolate mousse w/ morello cherries, with their syrup soaking the cake layers. Leather effects are done with a stonewall roller and marbling. It is a generic 8” round, about 2-1/2” thick, came out of the oven completely nice and level because of the baking strips (a.k.a. wet kitchen towel) that I’ve gotten into the habit of using. Mousse is like any other run-of-the-mill version – milk, heavy crème, cocoa, powdered sugar, some dark chocolate blocks and a left over small box of Nestle’s dark chocolate mousse mix (never using that stuff again, I finally read the contents and it has gelatin in it!). Garsh Torte is insanely rich, one can only eat a small slice… In my opinion, it is best served when it has had a chance to adjust to room temperature, though people are used to eating it right out of the fridge… Ok, now it’s time for some leftover cake! 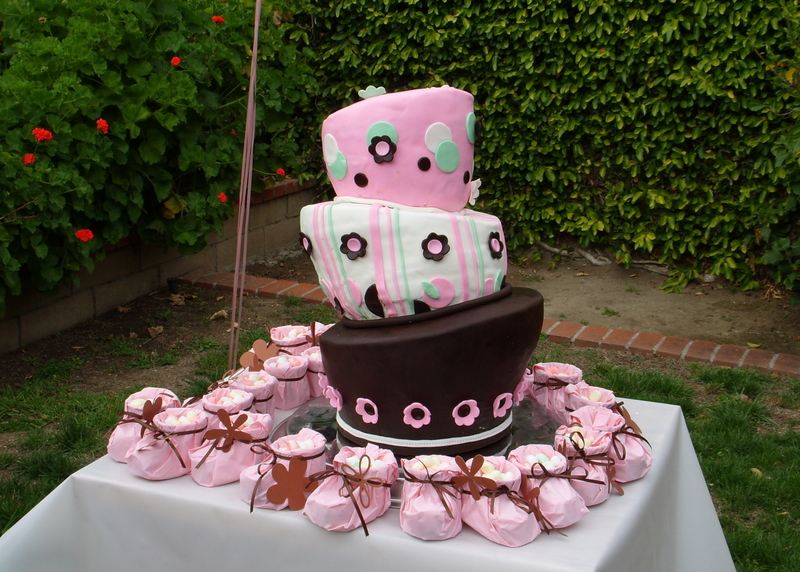 Baby shower topsy-turvy w/ pastry crème abyss! Made in two nights for the baby shower of a good friend, to match the crib set she chose and the party decorations at the same time. Sizes are supposed to be 10-9-8, 8-7-6, 6-5-4 inches, though I don’t think I carved out that much from the bottoms. Bottom tier is chocolate with roasted hazelnuts Kahlua ganache, w/ Kahlua simple syrup and espresso to enhance the chocolate flavor of the cake layers (yes, of course the mom-to-be was made fully aware of the potential harmful effects the miniscule trace amounts of liquor and caffeine per slice could have on the developing baby – blah! ), middle is vanilla with pastry crème (completely safe! ), top is alternating chocolate and vanilla with pastry crème and buttercreme. Covered in SatinIce. — I had to bake one of the vanilla layers twice, as I did cake mix (Dr.Oetker Organics) plus extender, but was on the phone with a friend, and I forgot to add the butter for the extender (!) so it only had the vegetable oil for the mix and its texture would be very wrong – I realized that 5 min into the baking, as I saw my nicely soften butter on the counter – on the bright side, it was ready for the redo, and now I still have two frozen rounds waiting their turn for cake truffles. — The milk for the pastry crème curdled when I heated it up (with an exp. date 9 days ahead) which threw me completely off schedule as I couldn’t run to the store that instant, in fact not until 4 hours later. 8” round, 3” thick cake, baked in a Pirex container (honestly I just wanted to experiment the difference in baking between the glass and my regular cake tins). Chocolate cake, with chocolate pastry crème filling and Ghirardelli chocolate buttercream frosting, all covered in fondant. I’d make it again in a heartbeat! I was in a flowers mood, so decided to play around with some flowers for a 3-year old princess’s birthday, who’s not very much into dolls and frills. Those were some contemporary girlie colors I already had and needed to use them up creatively… Carved the top alike the ballerina skirt cakes just to add some dimension, unfortunately not that visible from this angle…7″ round, 3” thick vanilla cake in 3 tortes, with cream cheese filling and fresh banana slices (yum! 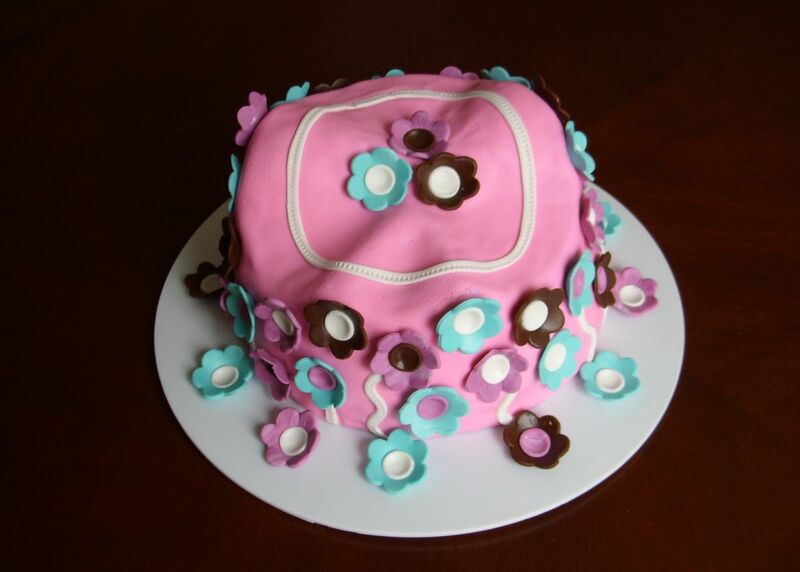 ), covered in fondant, with flowers 50/50 gumpaste/fondant. It was so much fun to make, I hope she liked it as much as I enjoyed making it! Now that I’ve mastered those flowers… next?! Title is pun… We used to live in a town called Flower Mound, in fact right behind the so-called place of interest, which while a mound, all right, had very little flowers to speak of, more like an alfalfa meadow, securely fenced off save someone would disturb the town’s namesake… I like my little pink-teal-and-brown rendition a lot better! Ever since I saw a “vertical” cake (a thin sheet cut in 3” strips, then layered standing up with ganache around the inside of a cheese cake pan) I have been thinking of turning my tiramisu vertical. It was a little challenging to do the first outer layer, as the biscotti kept falling in, a smudge of mascarpone fixed that. I like the result very much! 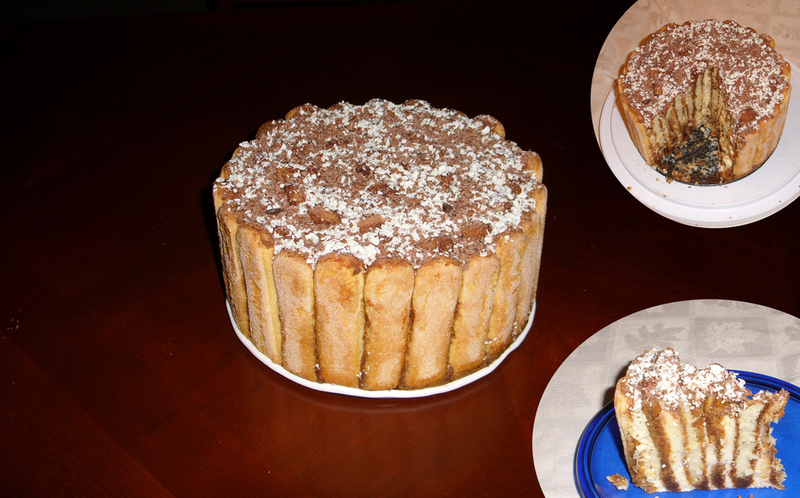 I do need to use an 8” instead of 10” pan, as it took 6 packs of biscotti instead of 4, it was HUGE and I didn’t have enough filling… Vertical tiramisu it is!